Dimensions 1.50 by 7.25 by 10.25 in. 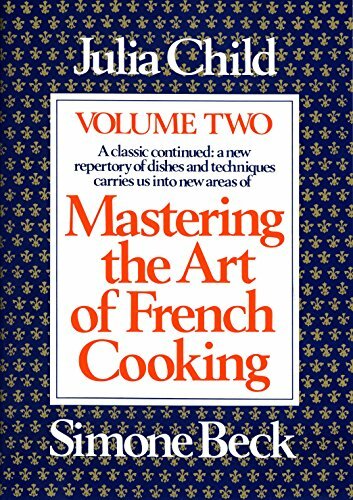 Amazon.com description: Product Description: The beloved sequel to the bestselling classic,Â Mastering the Art of French Cooking, Volume II presents more fantastic French recipes for home cooks. Working from the principle that âmastering any art is a continuing process,â here Julia Child and Simone Beck have gathered together a brilliant selection of new dishes that will bring you to a yet higher level of culinary mastery. They have searched out more of the classic dishes and regional specialties of France, and adapted them so that Americans, working with American ingredients, in American kitchens, can achieve the incomparable flavors and aromas that bring up a rush of memoriesâof lunch at a country inn in Provence, of an evening at a great Paris restaurant, of the essential cooking of France. From French bread to salted goose, from peasantÂ ragoÃ»tsÂ to royal Napoleons, recipes are written with the same detail, exactness, and clarity that are the soul ofÂ Mastering the Art of French Cooking. With Julia Child | Slp edition from Alfred a Knopf Inc (December 1, 2009); titled "Mastering the Art of French Cooking: The Essential Cooking Classics"
About: Explains for the novice American cook the special ingredients and cooking techniques involved in preparing the wide variety of French dishes featured.